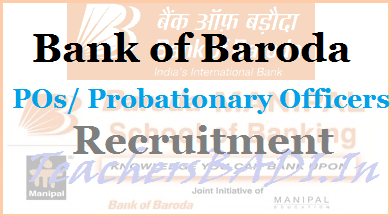 Recruitment of Probationary Officers through Admission to Baroda Manipal School of Banking: The official notification of BOB Manipal Admission 2018 has been released by Bank of Baroda (BOB) on its official website. BOB Manipal has invited application for 600 vacancies. The official statement reads, " A total of 600 students will be inducted in Baroda Manipal School of Banking through the current selection exercise for 2018-19 (April 2018 to March 2019). The intake of students in batches will be decided by the Bank, as per the requirement." Applicants are advised to check the official website to apply online - bankofbaroda.co.in. Aspirants are to note that the online application process for the BOB PO Post has started from June 12, 2018, on the official website of Bank of Baroda. The last date to apply online for the BOB Manipal PO post is July 2, 2018. The tentative date of the exam as per the statement is July 28. The total number of student intake and reserved student intake as given hereunder are provisional which may vary depending upon future needs of the Bank & availability of candidates under the respective category: SC - 90, ST - 45, OBC - 162, UR - 363. The age limit as on July 2 is - minimum 20 years and maximum 28 years. Candidates shall be selected through a selection process consisting of online exam (objective + descriptive) followed by Psychometric Assessment, Group Discussion and Personal Interview. Candidates age limit should be in between 20 – 28 years as on 01-04-2018. Age relaxation is admissible to 05 years for SC/ ST candidates, 03 years for OBC candidates and 10 years for PWD candidates as per rules. Eligible candidates can apply online through the website www.bankofbaroda.co.in from 12.06.2018 to 02.07.2018.